The updated UK population graph shows an actual trend trajectory as per the most recent ONS population data into Mid 2012 of 63.7 million and estimate into Mid 2013 of 64.3 million, which suggests that the UK population could increase by an additional 4 million by 2030 as a consequence of what amounts to continuing out of control immigration and high birth rate that in total would translate into a population increase equivalent to 15 cities the size of Birmingham. The actual rate of annual immigration averaged 250,000 per year or near 20 times the Labour governments propaganda that continued right upto the point Labour dumped the crisis in the lap of the Coalition Government in May 2010. The latest immigration statistics out of the ONS once more illustrate the magnitude of the ConLib Coalition governments own failure to control immigration where to all intents and purposes the past 5 years have just marked a continuation of the Labour catastrophe that set in motion a 15 year long immigration mega-trend for importing approaching 4 million people, where approx 90% of the adults were expected to vote Labour (low pay and on benefits such as tax credits). When David Cameron took power in 2010 he promised that he would cut net immigration towards the end of the parliament to the tens of thousands from the then disastrous annual figure of 205,000, instead the latest data from the ONS shows that net immigration has continued to SOAR to a level far higher level than in 2010 to now stand at 298,000 per year. The bottom line is that Britain's immigration crisis is ACCELERATING and is EXPONENTIAL where the Conservative Coalition Government has failed to do anything to control what remains out of control immigration. And remember that the official statistics do not include illegal immigration totaling at least 800,000. The Leaders and representatives of both major parties have been busy making statements in the run up to the May general election promising to control immigration in the future, however these amount to nothing more than bare faced lies when one considers the real fundamental drivers for immigration because if the politicians were really serious about controlling immigration than they would have already done so! Labour supports unlimited immigration because the vast majority of immigrants (90%) will tend to vote Labour i.e. be politically left of centre, therefore Labour sees immigration ultimately in terms of hundreds of thousands of new Labour voters each year who will ensure future election victories. Labour's strategy has therefore been highly successful as in a little over 10 years it has changed many constituencies in favour of voting Labour to the point where it has now become near impossible for the Conservatives to win outright elections such as the landslides achieved by Margaret Thatcher during the 1980's. Conservatives support immigration because it is highly profitable for their pay masters - big business, as the influx of migrant workers will tend to drive down wages for all workers thus deliver higher profits for business. Academic economists may rightly argue that by doing so businesses will ultimately erode their own profits as workers who earn less also spend less. However what academics fail to appreciate is that the state steps in to fill the gap by subsidising workers through tax credits and funding the lifestyles of some 9 million people who are economically inactive all of which is paid for by money conjured out of thin air i.e. government debt that is not backed by any economic activity that acts to inflate the economy, and thus corporate profits which are leveraged to inflation. 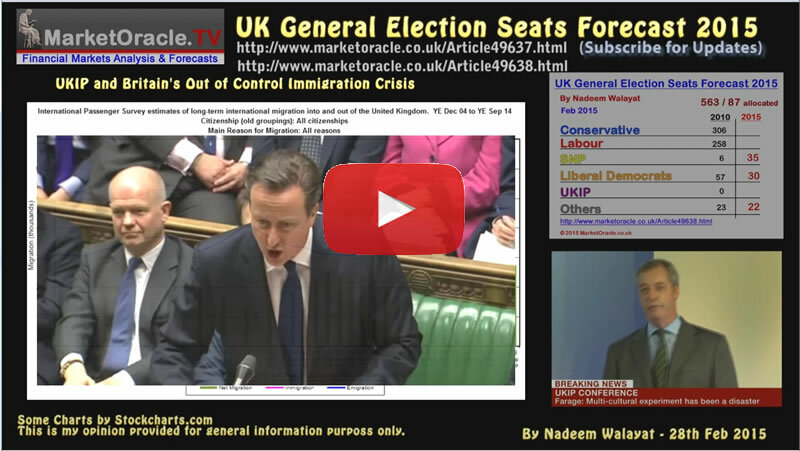 Therefore one should realise that high net immigration is in the interests of both major political parties both in terms of votes and for those that bankroll the parties, which means that neither Labour nor Conservatives will actually do anything significant in respect of controlling immigration, so everything you are hearing in the mainstream media from the politicians such as Cameron promising a EU referendum in 2017, some 2 years AFTER the next election is purely smoke and mirrors propaganda to mislead the population into thinking that something will eventually be done about Britain's immigration crisis. So whilst each political party has been busy announcing a string of policies to control immigration, but they will break ALL of their immigration promises just as they have done before because it is not in either major parties interests to control immigration. In fact the only party to seriously and consistently advocate immigration controls is UKIP. The consequences of net immigration of near 4 million people can most visibly be seen and felt in the UK housing market where house building has abysmally failed to keep pace with Britain's population explosion, a crisis that was further exacerbated following the financial crisis that induced a slump in house building as the below graph shows the UK annual population change against annual new housing build completions. The graph illustrates two a major long-term shifts that took place in the UK housing market dynamics since 1980. Margaret Thatchers 'Right to Buy' your Council house policy appears to have acted as a huge disincentive for local councils to build properties, where council house building literally collapsed from 100,000 per year in 1980 to just 20,000 per year by 1990 and by 1995 had fallen to less than 2,000 per year, where local authority house building has languished ever since, even under 1997 to 2010 Labour government as Right to Buy has acted as a huge disincentive for local authorities to build properties that they may be forced to sell off within a few short years. By 2000 the annual increase in population as a consequence of Labours immigration policies started to far exceed the number of new builds that ended the preceding overall trend for construction to exceed population growth in terms of addressing the UK's long standing housing shortage, especially considering that the average size of households has continued to shrink falling from 3.1 in 1960 to just 2.24 in 2014 (one of the lowest in the world) as a consequence of the increase in single person households and single parent families. Whilst instead of doubling house building during the immigration crisis the near exact opposite has taken place as far fewer houses were built each year during the noughties. The ratio of average household size is still trending lower which means that even if the UK population suddenly stopped increasing then the falling household size ratio towards 2.15 by 2030 would still imply EXTRA demand for 1.25 million properties to be built just to stand still. The below graph further illustrates the ratio between the accumulative change in population since 1970 against the accumulative number of new housing builds also since 1970 as an over crowding ratio overlayed with UK house prices that illustrates the worsening trend in the level of over crowding due to inability of new supply to meet new demand that just keeps accumulating each year. This better illustrates the change in trend that started to take place during the mid 1980's that coincided with the Thatcher governments reversal of the policy for the construction of social housing and implementation of the right to buy scheme that to date has resulted in the sale of over 2 million socially owned local council housing that fueled the property boom of the nineties AND noughties, the trend that was set in motion was for the inability of supply to keep pace with population growth which ensured continuously persistent upward pressure on house prices that despite the great recession of 2008-2009 still showed an accelerating trend as new build supply that currently stands at an estimated 140k per year is set against government estimates for a requirement of at least 250k properties per year, with 300k a more realistic estimate when the trend for a falling household size is taken into account, which thus ensures that the UK's over crowding situation is expected to continue to worsen year on year going forward, especially if the size of average households continues to shrink which would require about 70,000 new builds per year even if the population stopped increasing. The bottom line is that the UK housing crisis is being primed to explode! Britain is literally being sleep walked towards having to painfully deal with its extreme consequences due to the failure of successive governments to take pre-emptive action before the crisis explodes, which it will probably do some time before the 2020 General Election, forcing politicians to think the unthinkable in an attempt to bribe voters. New build supply plays an important role in the housing market as it tends to average at approx 10% of the total number of annual transactions, which is more than enough to have a significant effect on the UK housing market especially as supply over recent decades has been consistently below that which is deemed necessary to meet the demands of a growing population which means that the UK housing market was never destined to replicate the housing busts of countries such as the United States or even closer to home of countries such as Spain, where that housing bust has prompted many hundreds of thousands of British ex-pats to cut their losses and return to the UK, closely followed by unemployed Spanish and other PIIGS citizens seeking employment in a far more liberal and robust UK jobs market and thus introduce new demand into the UK housing market as they seek accommodation. Other examples include the crackpot French tax policies that led to an exodus of 450,000 French professionals to London. This suggests that the often put forward academic standards in terms of valuing the housing market affordability ratios such as X3.5 salary towards the likely path for the UK house prices does not take into account that of new demand against new supply trend that implies affordability ratios look set to be pushed ever higher to new trend extremes, and therefore supporting long-term rising price trends for UK house prices in real terms, i.e. expensive UK house prices look set to be here to stay for as long as the lack of new supply exists, especially as the UK population is expected to grow by at least another 5 million over the next 10 years and probably exceed 6 million which demands at least an extra 2.5 million homes to be built which is set against an realistic estimated construction of just 1.4 million new homes, which means UK over crowding is going to continue to get much worse and thus drive house prices ever higher regardless of what the academics say should happen. The bottom line is Britain's over crowding ratio insures that no matter what the arguments are put forward by academics that most people can no longer afford to buy so house price rises must be unsustainable, instead the UK population growth fundamentals are such that their arguments just do not matter, the only thing that can effect this fundamental trend is if the UK literally doubled the number of houses built per year, and even then it would not result in a fall in house prices but tend to index house prices to inflation. But off course that is not going to happen, the UK is not going to build anywhere near 300,000 homes per year, as the reality is that for most years UK house building will be short by as much as 150,000 completed new builds each year which just compounds the housing market demand vs supply pressure and thus exerts further upward pressure on house prices. Britain's demographic crisis as illustrated by an ever growing ageing population that despite an increasing number of workers due to immigration cannot maintain ratios of the past, where 20 years ago there were 8.9 million pensioners against 28 million workers or a ratio of 3.15 workers to every retiree (15.5% of the total population), today there are over 11.8 million pensioners to 30.9 million workers, a ratio of 2.61 to 1 (18.45% of the total population). Britain's growing elderly population demanding an ever greater share of the economic pie that puts an ever increasing burden on the welfare state services such as the NHS that will continue to severely impact the economy. There is no end in sight to Britain's demographics crisis as an ageing population looks set to see the number of retirees increase from approx 11.8 million today to 13.5 million by 2020 the impact of which is partially being offset by Britains rising population from 62 million (2010) to at least 67 million by 2020, which whilst putting Britain in a far better state than many other countries who's total population and worker base is already shrinking as well as experiencing an increasing ageing populations such as Japan, however an 8% increase in the total population against a 17% increase in retirees is not going to offset the impact of the increasing number of retirees as the ratio of workers to retirees continues to fall, especially as this trend looks set to continue to 2030 and beyond by which time the number of over 75's looks set to literally double in number, rising from 8% of the population today to more than 13% and in total approx 25% of Britain's population will be over 65 which suggests an unbearable ratio of 1.9 workers per retiree 1, which implies that huge amount of purchasing power of workers will be lost over the next 20 years. The consequences of Britain's demographics are as I pointed out over 5 years ago in the Inflation Mega-trend ebook of Jan 2010 (FREE DOWNLOAD), that governments only ever have one solution which is to PRINT MONEY be it called debt that will never be repaid or QE or a multitude of other examples such as Funding for Lending, and the consequences of the perpetual exponential money printing is as I have written of on a near monthly basis is for continuous exponential inflation. This is why whenever I hear warnings of deflation, I consider the proponents as being delusional because there will never be persistent DEFLATION! The impact of the demographics crisis on the UK Housing market is suggestive of increasing supply from the mid to upper range of the UK housing market as many people approaching retirement will have during their working lives looked on their homes as a means of providing for them in their retirement as they expected the rise in house prices as a consequence of inflation and economic growth to result in a profit far in excess of any outstanding mortgages at the time of retirement and in most cases they will have played the property market wisely as many will be sitting on small fortunes, especially those that bought in the South of the England 30 or even 20 years ago. Therefore a significant number of retirees look set to continue to either downsize or move into retirement homes or the new retirement villages that have been springing up, which will in part free up supply to put a dampener on rampant house price inflation of what we saw during the last boom whilst INCREASING demand for smaller properties in retirement towns and areas of the country such as sea-side towns. Furthermore the psychology of seeing ones property as a retirement investment is widespread amongst all ages so continues to act as an encouragement to buy as people who cannot ever imagine that properties will ever yield less at the time of retirement than they do when bought, but instead the mindset is fixated on what has already come to pass for their parents and grand parents generations. In addition to this we have the wage slaves with less real terms disposable income to pay towards housing costs in terms of mortgages which on face value implies a persistent real terms deflationary outcome for UK house prices over the next 20 years. However this has to contend with out of control immigration coupled with domestic population growth as immigrant couples tend to have larger families which coupled with the benefit culture baby making factories will result in at least 10 million extra people, a trend that is more than capable of overcoming the deflation as a consequence of the ageing population that ultimately has to imply persistently high real rates of inflation not just for house prices but for sectors right across the economy. Furthermore as more of the benefits for life claimants are increasingly encouraged or forced into work, in addition to many more retirees continuing to work in some capacity will improve Britain's productivity which coupled with ongoing exponential technological advances will mean that a forecast ratio of workers to retirees that is unsustainable today could become sustainable 20 years from now which ultimately translates in workers being able to support a greater proportion of their wages being spent on housing costs in terms of affordability than is the case to today, which is why those fixated on affordability ratio's as compared against the past will continuously find themselves wrong footed, as ratios get ramped ever higher from 20% of income 20 years ago to 1/3rd of income today to 50% of income in 10 or so years time. Therefore the message being painted by this demographics analysis supports my long standing view that one of the only ways for people to leverage themselves to the exponential inflation mega-trend is to be exposed to assets such as housing and not only that but whenever prices fall due to fluctuations in the business cycle even if not in nominal terms but just in real terms (after inflation) than buyers should seize the opportunity presented because the over riding trend is for rising house prices over the next 20 years, a doubling then tripling in house prices by 2030! Where ALL of the risks are to the UPSIDE, i.e. out of control inflation which may in its immediate aftermath result in a real terms drop but which would sow the seeds for the next ramping higher in house prices just as the Great Recession house prices depression has resolved into today's bull market. Where house prices are concerned the key driver is the inflation consequences as virtually ALL political parties propose the same policies for inflation inducing deficit spending financed through printed money be it called QE or government bonds. Even the austerity coalition has shown itself to be far from that in truth for in nominal terms the Coalition government has printed the SAME amount of debt as the Last Labour government did. Even debt as a % of GDP has risen under so the called economic austerity coalition government to 75% which is some 7% above where ConLib originally forecast it would be. Therefore the inflation mega-trend will continue its inexorable climb around which asset prices such as stocks and housing oscillate. So no matter what form the next government takes, all of the fundamentals will remain in tact for rising house prices for the duration of the next parliament. So where the parties are concerned it boils down to degrees of money printing inflation i.e Labour / Lib Dems will print more than Conservatives, and the SNP a lot more with the Greens barmy policies destined to hyperinflate! Where it is only UKIP, given severe immigration policies would impact on the UK house prices bull market though of course they say one thing whilst campaigning and would likely do other when in power, so yes they too will print money too to buy votes. For housing market election bribes we only need to look at the March budget announcement of the Help to Buy ISA (savings account), that for every £200 saved will have £50 added to by the government i.e. a 25% government house buying deposit subsidy that currently converts into a maximum of £3,000 per prospective home buyer (£12k total deposit) that I am sure will be raised annually, and which for couples implies a £6k subsidy. Which acts to boost DEMAND and this add further fuel to the UK house prices bull market that illustrates just one mechanism for the government printing money to inject directly into the UK housing market via voter bribes. And the just published Conservative manifesto centre piece is to extend the near 35 year right to buy your council house scheme (over 2 million sold) to 1.3 million housing association tenants so that they too may buy their homes at deep discounts of as much as 70% / £102,700 per property in London and £77k for the rest of the UK. The starting discount for housing association homes after 3 years of tenancy will be 35%, rising by 1% per year, and 50% for flats rising by 2% per year. Though I don't see how this would exactly work because the Conservatives are proposing to sell homes they do not own, so may face stiff resistance from housing associations. Additionally the Conservatives will seek to force councils to sell their remaining most valuable properties estimated at 200k at the rate of about 15k per year. Clearly both policies are aimed at attempting to bribe Labour leaning renting voters into becoming owner occupying Conservative voters as £77k to those outside London is a pretty big bribe! That and forcing the sale of the most valuable council houses is aimed at bolstering the vote in Conservative voting constituencies as that is where the most valuable council housing stock will tend to be situated. This will mark just the latest of a whole stream of continuous house prices boosting voter bribes that all governments engage in as the recent March Coalition budget illustrates with the announcement of the Help to Buy ISA (savings account), that for every £200 saved will have £50 added to by the government i.e. a 25% government house buying deposit subsidy that currently converts into a maximum of £3,000 per prospective home buyer (£12k total deposit) that I am sure will be raised annually, and which for couples implies a £6k subsidy. Which acts to boost DEMAND and this adds further fuel to the UK house prices bull market that illustrates just one additional mechanism by which the government prints money to inject directly into the UK housing market so as to bribe voters. The cost of today's voters housing market bribe will be at least £5 billion a year, and probably several billions more a year when the extra cost in housing benefit paid out in rent to private landlords has been factored into the equation. Looking beyond my existing five year forecast covering the period 2014-2018, that after 7 years of relative economic pain (2008-2014) as illustrated by the cost of living crisis, Britain is at the beginnings of a 7 year economic boom (above trend growth) that can only continue to drive the UK house prices bull market to well into the 2020's, for which I at least expect an average price increase of 10% per annum, that's a minimum 70% price rise on current house prices! Details on this to come over many more years so ensure you are subscribed to my always free newsletter to get in-depth analysis and detailed trend forecasts in your email in box. The following graph further illustrates the fall in momentum during the second half of 2014 and that this years surge to back above 10% has already evaporated as momentum has now slowed to +6.6%, so it appears the Coalition government will miss setting a new UK average house prices record high just prior to election day, probably due to ongoing weakness in house prices in the South East. Therefore can expect a continuing slowdown in house price inflation during the summer months. In fact the momentum trend is likely to be very similar to Labours 2010 house prices mini-election boom that I had started to warn to expect from mid 2009. Though at this point I am not expecting a similar post election collapse to -5% as that was as a consequence of Labour going for broke on a near £160 billion annual deficit debt printing binge. Whilst the most recent polls are now marginally putting Labour ahead of the Conservatives. However my long standing analysis of seats vs house prices trend trajectory painted a picture for a likely probable Conservative outright general election victory. The updated election seats trend graph illustrates that the Conservatives are trending towards achieving a single digit outright majority election win which NO ONE, and I mean no serious commentator / analyst either has or is currently advocating, so it would come is a big shock to pollsters on election day! “We saw in that leadership election just what he would do to get into power. We saw what he did to his own brother. We need to know what he would do. "We can't be sure what kind of backstairs deal he is likely to do with the SNP... that is the uncertainty." Now some five days on the polls have swing in Labours favour as voters were clearly put off by the personal attacks against the Labour leader. Whilst today Labour published their manifesto (election bribes booklet) which I am sure the political pundits will go through with a fine tooth comb. Though the strong probability for a hung parliament makes manifestos redundant, not just because politicians lie and make promises that they just cannot keep with a long list of excuses ready as to why they could not fulfill their promises, but that post election parties will negotiate the actual programme for government as part of a coalition agreement. So today's Labour and tomorrows Conservative Manifestos are approximately 50% BS fantasy election bribes. The opinion polls currently forecast seat averages for Conservatives on 274.5 and Labour on 276.5. The calculations for what form a coalition government could take become extremely complicated if not impossible without resorting to a truly messy and disastrous outcome that involves the Scottish Nationalists i.e. Which means the ONLY viable / workable outcome is one that involves the SNP i.e. Labour + SNP (49) =325 - SUCCESS, with perhaps the Lib Dems deciding to tag along for the limousine rides. Have consistently exhibited a strong bias towards Labour which has been slowly eroding over time that suggest will converge with other forecasters over the next few weeks. Overall the opinion pollsters are currently trending in favour of the Labour party which if the trend continues implies that Labour will be the largest party on election day on about 290 seats that is contrary to my forecast expectations for the Tories to lead with at least 296 seats. Another point of difference is that pollsters continue to grossly over estimate the number of seats the SNP will win i.e. typically 48-54, against my expectations of just 35. In my judgement the opinion polls remain wrong as they continue to persistently under estimate the number of seats the Conservatives will actually win by a widening margin, who in my opinion could still even win an outright majority on May 7th. The opinion polls suggest that the UK is going to take a gamble on a Labour SNP government which my analysis has consistently warned will be a losing bet for Britain (SNP Labour Death Embrace). However, as is often the case that the opinion polls can be wrong, just as the Scottish referendum reality was never the 50/50 proposition that opinion polls suggested at the time (45/55), and so today's marginal advantage to a Labour SNP Alliance should at least resolve in a continuation of the Conservative / Lib Dem Coalition. Though the Conservatives may try to go it alone with the objective of a second better engineered election outcome within the next 12 months as the economy continues to grow above trend. The bottom line is that no matter which major party forms the next government, it will only make a marginal difference to the trend in UK house prices for the fundamental mega-trend drivers of population growth and lack of new house building. Therefore in terms of house prices, the difference between a Labour and Conservative led government will be approx 1-2% per year. Of course this trend is unsustainable as it becomes increasingly impossible for even well paid workers to climb onto the housing ladder, and even worse for the low paid where for instance if the Conservatives win will see even less social housing as existing tenants will refuse to budge as they see their housing association rental property in terms of the £77k to £103k potential pot of gold that they hope to someday, somehow capitalise upon, which if they do so ultimately means approx 40% of which will be sold onto the private rental sector. Thus as I stated earlier that Britain's housing crisis is storing up the potential for a huge deal of social unrest because as much as 1/5th of the UK population may be locked out of the UK housing market in the private rental sector, which implies that under political pressure from such a large number of potential voters that in the lead up to the 2020 General Election political parties may announce what is unthinkable today that is for a catastrophe for buy to let investors as the right to buy scheme is extended once more to the private rental sector that would result in a panic exodus at least at the bottom end of the UK housing market. No new concessions must be made to the SNP. A Con-Lab coalition might be the only way to avoid such a disaster. Scotland rejected independence, so the Union must now be maintained at all costs. I wouldn't be surprised to see expanding emigration of younger highly educated Brits, the cost of housing is so high it would surprise me if a large amount don't leave and move to a place where they have a better standard of living and more cash in pocket. No doubt they'll be replaced by immigrants from elsewhere so won't affect the demand for housing overall.